No enclosing boundary box is needed. Segments only the boundary surfaces of your system rather than the volume space between them (mesh). This eliminates one dimension of complexity. Two steps: Calculates surface charges from surface potentials, and then calculates potentials and fields in space from these surface charges. Is ideally suited for space-charge problems. Replaces the Finite Element Method (FEM) and Finite Difference Method (FDM) used in other programs. Figure: Nanocones as field emission sources. The BEM is ideal for small structures in the presence of large electrodes as well as open systems. Adaptive surface meshes get smaller where accuracy is critical. The Boundary Element Method (BEM) is a highly accurate method used by CPO to find electrostatic potentials and fields for systems of conducting electrodes. and the standard data book Electrostatic Lenses, by E Harting and F H Read, Elsevier Publishing Company, Amsterdam (1976). The principle of the BEM is simple. The method is based on the fact that in a system of conducting electrodes, real charges appear on the surfaces of the electrodes when potentials are applied to them. In the absence of leakages, these charges will remain when the leads that have carried the applied voltages are removed. These surface charges are then the sources of all the potentials and fields in the system. In the BEM the electrodes are effectively replaced by these charges. (in SI units) which is uniformly distributed on its surface, as illustrated in figure 1.2. 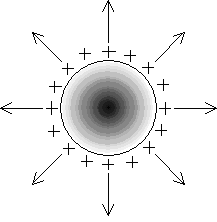 Figure 1.2 Surfaces charges and external field of an isolated conducting sphere. The potential and field are due to the surface charges on the sphere. If the sphere could be removed without disturbing the surface charges then the potential and field would remain unchanged. As stated above, the surface charges are the sources of all the potentials and fields in any electrostatic system. If all the surface charges are known then the all the potentials and fields are also known. In the BEM the surface charges are deduced from the potentials applied to a set of electrodes. Modeling: The only parts of the system that the User has to model are the surfaces of the electrodes. 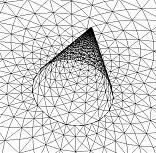 It is not necessary to create an artificial set of points in the space enclosed by the electrodes (as is needed in the Finite Difference and Finite Element Methods). Nor is it necessary to enclose the system of electrodes. There are no restraints on the relative sizes of the electrodes. Cathodes can be of almost any shape and are easy to deal with.